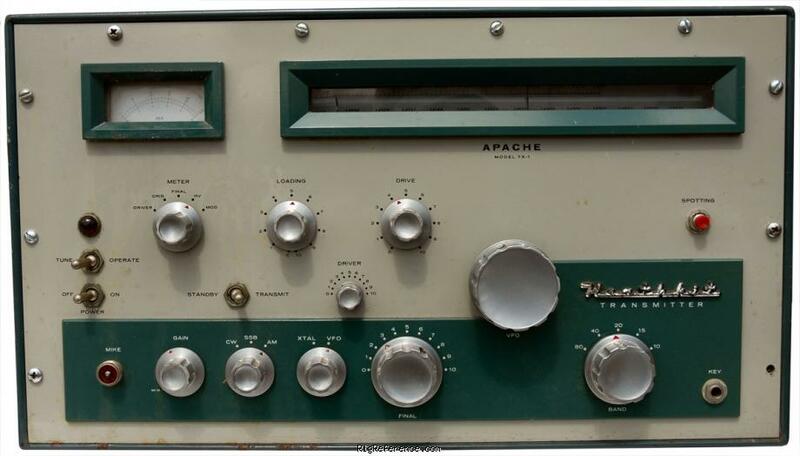 The "Apache" operates with 150 watt phone input and 180 watt CW input on 80 through 10 meters and features chassis provision for plug-in connection of the Heathkit SB-10 SSB adapter. A specially-designed VFO provides minimum drift frequency control necessary for SSB transmission. The illuminated, rotating slide-rule VFO dial with full gear drive vernier tuning provides ample bandspread for accurate frequency settings. Each amateur band is separately calibrated on the rotating slide-rule dial for maximum accuracy. Also featured in the "Apache" is adjustable low-level speech clipping and a low distortion modulator stage employing two 6CA7/EL34 tubes in push-pull class AB operation. Time sequence keying is provided for "chirpless" break-in CW operation. A "spotting" push button allows tuning of the transmitter before switching on the final amplifier and also enables the operator to "zero beat" an incoming signal without placing the transmitter on-the-air. The final amplifier is extensively shielded for maximum TVI protection and is neutralized for high stability. Pi network output coupling provides smooth loading into antenna impedances of 50 to 72 ohms. See also the companion receiver, the Heathkit RX-1 "Mohawk"
Estimating the value of a rig can be challenging. We collect prices paid by real hams over the years to help you estimate the current value of the Heathkit TX-1 'Apache'. Just bought or sold this model? Let us know what you traded it for and help other ham operators!